Hey guys! 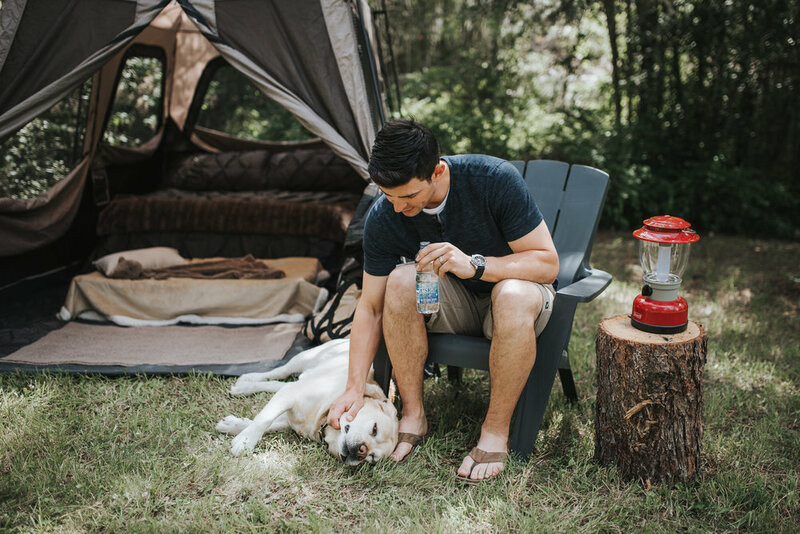 Today's blog post is all about one of our favorite summer activities, camping! We don't get out as much as we would like but we usually go a few times a summer. I love being in the outdoors, and tent camping but I also like to be in a decorative, nice space. So I guess you could call this glamping. The hubby used to put up a little bit of a fuss about this but once he realized were not taking any extra stuff, just making prettier choices he got on board. We use just a plain old air mattress but instead of sleeping bags, we bring along actual bedding. This is more comfortable to sleep in, and when you get home you can just throw the sheets in the wash, no need to take your sleeping bags in to get professionally cleaned each season. And you have to have an extra blanket in case it get's cold so you may as well get a cute one to put at the end of the bed when it's not getting used. For Liv's bed, we use a little pop-up cot from Amazon ( I linked it at the end of the post). Here we just used extra blankets, but I have since ordered her a little sleeping bag from Restoration Hardware. I can't talk Carey into packing a table for the tent but a lot of the time we are able to find an uncut fire log that we can use as a table. We save our actual lantern for the outdoors and then get a smaller (prettier) one for inside the tent. It is a small touch that adds a lot of style to the space. Lastly, all you need is a little rug to really make it feel cozy! Some throw pillows would take it over the top...but I still can't seem to justify packing those along. 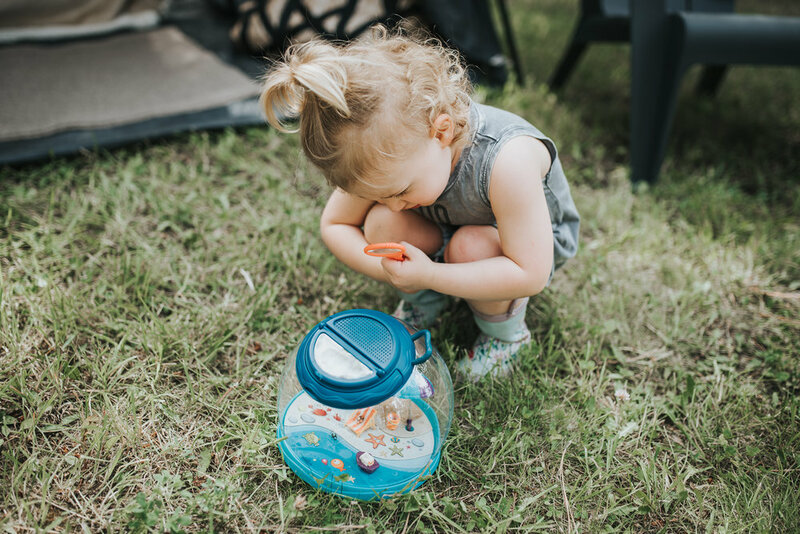 Last time I posted about camping I got a lot of questions about camping with a toddler. To be honest it is one of the easiest activities to do with kids! There is so much to do and explore, I can't imagine any kid not liking it. 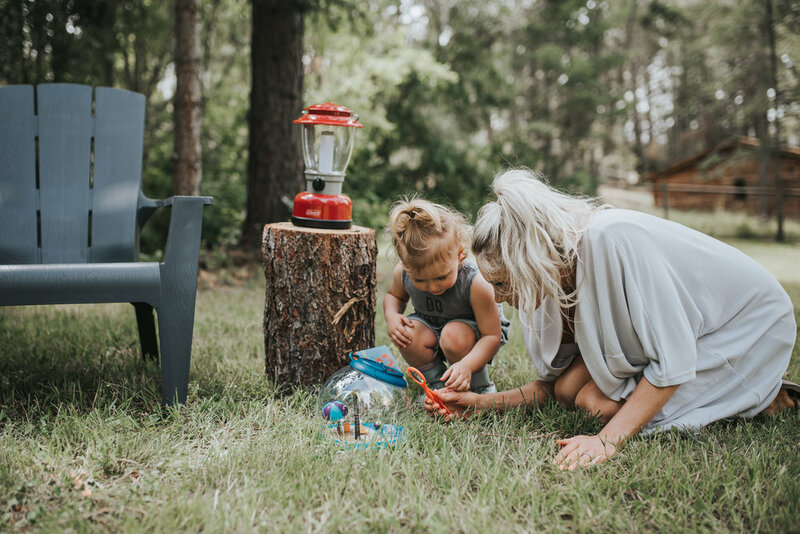 We also try to get some new outdoor toys to give Liv while we are camping. This last time we gave her this super cute Bug Hotel from Fab Baby Gear. She absolutely loved it and kept her entertained all weekend. We do cheat a little and bring the iPad along. Watching a few minutes of a movie before we start getting ready for bed has become a little bit of a routine and helps liv settle down.